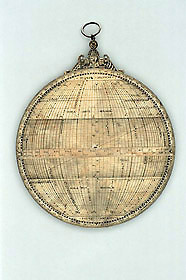 This astrolabe does not have the customary set of plates, but instead the universal projection associated with the Spanish mathematician Juan de Rojas, which allows the instrument to be used in any latitude. Made in Paris in 1551, it resembles very closely the instrument illustrated in a book by Rojas on this type of astrolabe, published in Paris the same year. This resemblance includes the decorative features, such as the throne incorporating a head, as well as the technical elements, but the relationship between the book and the instrument is not known.